~Salsa by the Sea FREE 4-7 pm by boardwalk next to the IDEAL restaurant. The Bold Knight and MamboElite.com bring salsa dancers music and lessons every Sunday. Two levels of hardwood floors allow for plenty spance to spin and move. A full bar serves popular drinks and appetizers. Beginners take a lesson at 5:30 and follow through with Partnerwork at 6 pm. The music begins and floors open at 6:30. Dance your heart out till 11:30. Enjoy the lessons and party for only $8. The Bold Knight 840 N 1st Street, San Jose 95112. 7pm- Full Body Workout offered at both the Beginner and Intermediate level. So you don't have to either worry to catch up or wait for others to catch up. .
8pm. Intro and Beginner Level Rueda offered in three groups: Intro, Beg 1, Beg 2. New Pricing: One class is $7/$5 for students with valid ID. 7 pm- Full Body Workout at the Beginner and Intermediate Level. You don't have to worry about catching up or wait for others to catch up. 8 pm-Intermediate level classes offered in three groups. 9 pm- Advanced/Performance Practice for students who have mastered all moves and dance comfortably at Intermediate Level 4 of both A Week and & B Week group. ~Salsa Gente's 5 Week Salsa Crash Course for Beginners continues at 7pm. Registration is required for this popular series. If you weren't able to join Chris and Jessica for this series, visit SalsaGente for upcoming series and special classes. This is a five-week crash course for everyone who wants to learn to dance regular Salsa with some Cuban flavor. In other words, this is a regular Salsa class using Cuban-style techniques. The goal is for you to shine on the dance floor! NO PARTNER REQUIRED. 8pm Salsa Gente offers Beginner 2 Salsa alongside a Bridge Class! Enjoy the Two-for-One discount. ~Last class in the West African & Afro-Cuban Master Series featuring Drum, Percussion and Song. This is an excellent opportunity for Salseros and Salseras to learn more about expressing rhythm using their bodies. The class is taught by Chief Yagbe who is a distinguished drummer and singer/composer. For more information on upcoming classes and series visit Dance of Brazil. ~ Salsa Dance Party Every Thursday at Cabritos Mexican Bistro has great food, good music and a full bar. It also has a large hardwood dance floor. Salseros and Salseras 21 and over are welcome to dance from 8pm-1am every Thursday. Best of all there is NO COVER! Cabritos, 72 South First Street, San Jose. 408.515.2101 Email salsavoz@gmail.com for more info. 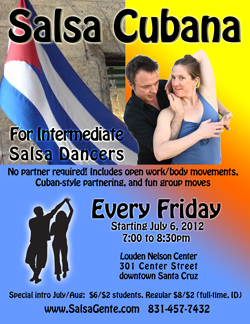 ~Salsa Gente offers Salsa Cubana 7-8:30 pm. Intermediate level dancers are asked to join this class that teaches Cuban style Salsa. See above Announcements for more details.